About me - jeroenkuipers page! 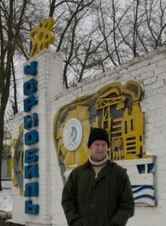 Jeroen Kuiper is a Dutch tourguide and journalist in Berlin, Germany. I guide visitors on bike and by foot through Berlin. I do this in Dutch, German, English and Spanish. For more information about that, you can visit www.deberlijngids.nl. 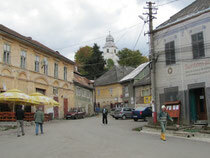 Furthermore, I work as a tour guide in Poland, the Baltic countries and Caucasia. I am also a journalist and writer. 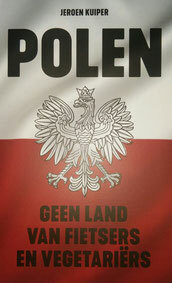 In november 2018, my new book about Poland was published in The Netherlands: `Polen, geen land voor fietsers en vegetariers`. You can find it at online shops such as www.lecturis.nl and in bookstores. Every now and then I write for Dutch and German newspapers and magazines. I am mainly working in Germany, Eastern Europe and Latin America. If you google my name at www.groene.nl and www.freitag.de, you will find features from me from all over the world. You can read some of my texts about Latin America at www.themedellinoffice.com. In the past, I worked for a.o. Vrij Nederland (NL), De Groene Amsterdammer (NL), VPRO radio (NL), Die Welt (DE), Freitag (DE) and Knack (BE). In 2009, my first book came out: `Het andere Duitsland. De voormalige DDR 20 jaar na de val van De Muur.´ You can order this book as an e-book at www.uitgeverij-fosfor.nl. If you have any questions, just contact me at mail ( a ) jeroenkuiper.net! 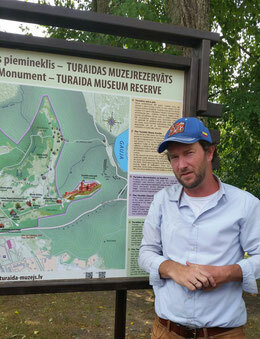 Explaining a group of Dutch tourists where to go in the Latvian Turaida Park is serious business:-)!!! MEDELLIN - New times in Colombia? After having deceptioned the Colombian people time after time during the past decade with unfulfilled promises, this time the relieve was as great as it could be, after the FARC kept its promise this time: it released its ten last `political prisoners`. Some of the four soldiers and six policenmen had been held for more than twelve years in the jungle. Some of them had been chained to eachtother for several years already. Not only did the rebels on rubber boots release these ten prisoners, they recently also announced that in future they will refrain from taking people hostage as a means of finacing their `revolutionary fight`. The FARC moves come at a moment that the organisation is under fierce fire. Over the last weeks, the Colombian army killed almost seventy rebels during several attacks in different parts of the country. She uncovered FARC camps in Panama, disclosed weapon arsenals and celebrated the death of several mid-level FARC commanders. Although nobody knows the exact figures, specialists estimate that the numbers of FARC rebels decreased by half during the past decade, to roughly 8.000 persons under arms nowadays. Above all this, the FARC lost almost all of its long-time leading commanders from the secretariat, the highest FARC gremium. They were killed by the Colombian army one by one during the past years. By far the biggest part of the Colombian population is fed up by the FARC, which says to by fighting for a socialist state since 1964. Colombian President Santos called the moves by the FARC ´important steps in the right direction`. He added however that these steps were `not enough`. As soon as the FARC would be sending `clear and serious signals` of a `sincere will to peace`, Santos would be willing to participate in peace negotiations personally. Before Colombia gets that far, however, there are still thousands of Colombians waiting for a sign of life of the several hundreds of civilians held hostage by the FARC. The last –failed- peace negotiations between the Colombian government and the FARC date back to 2002. The weekend magazine of French newspaper Le Monde published three stories produced by www.disputedwaters.com, a journalism project in which I am involved as well. 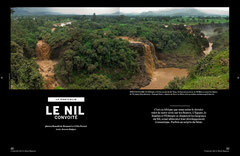 Here you find a link to the stories I made about the Colorado and the Nile, together whith some photographer colleagues. These are my first publications in French! Have you ever heard of land grabbing? Well, if not, you can read all about it in my feature in this week`s German weekly Freitag, which means, you will have to read the text in German. You can find it at page 9. Last August, I visited Ethiopia, which seems to be the world-wide centre of land grabbing. Mainly Asian companies, for instance from India, South Korea and Saoudi Arabia are buying up huge pieces of land for really small sums, in order to ´develop´ these lands for soy-, rice-, palmoil-, or seed production, usually mainly for export. The local population often has very few benefits of this land grabbing. Sudan, Ethiopia, Ruanda, Uganda, Tanzania, Burundi, Democratic Republic of Congo: not only Egypt wants Nile water. Since the moment that -except for Egypt and Sudan- all other countries mentioned above started the so-called Nile Basin Initiative (NBI) in 2009, politicians in Egypt and Sudan have been in a state of alarm. The other countries announced they want a bigger share of the Nile water for their development, and so Ethiopia for instance started the construction of dams in the Nile headwaters. Sudan and Egypt frantically disagree with the plans of the upstream countries. Since its canvas inception in 1987, DINA Farm has grown into Egypt’s biggest dairy farm, with currently 7000 American-bred Holstein cows, producing milk for more than 20 outlets in Egypt. The farm has its own milk pasteurising plant, furthermore there’s a slaughterhouse and DINA farm grows vegetables and fruits as well. DINA farm takes its water through roughly 120 wells, that pump up ground water from a depth of more than 150 metres. In the near future, water might come to the farm through a big water pipe from the Nile as well. The river runs just ten kilometres east of the farm. ‘I don’t worry about a shortage of Nile water’, Dr. Waeed assures. ‘I know the Ethiopians want to use more Nile water. But it won’t work for them. I’ve been there, it’s such a mountainous country, there’s no space for extensive agriculture. Besides, climate change might even bring more precipitation to the mountains of Ethiopia, leaving more water for us. No, the future of agriculture in Northern Africa is in the Egyptian desert. Who knows, we might become big exporters of agricultural and dairy produce to the region. Mohamed el Anwar (34) comes from Dakhla in the western desert of Egypt, but the last two months he spent most of his time on the Tahrir square, which has become the centre of the Egyptian revolution. He`s there this evening as well, trying to convince people to vote NO during the referendum vote this Saturday the 19th of March. Although the Tahrir square has been literally swept clean of demonstrators, dozens of people are still discussing in the streets. `We do not agree with the proposals for changes in the constitution, because it is only half work. We want a completely new start. 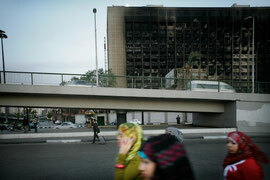 I think most people will vote against; if not, we will have a problem again in Egypt. Later this evening, we got involved into a sort of fight. In one of the main streets all hell broke out because of January the 25th, the day which is regarded as the beginning of the revulution/coup in Egypt. Crowds gathered, people screamed, cars honked. What had happened: the street vendors had just started selling their new ´25th of January´ stickers. Cairo is alive and kicking! Cairo, March 16th, 2011 – I just arrived in Cairo, this moloch city on the longest river in the world: the Nile, with a length of 6700 kilometers. During my flights from Berlin to Istanbul and then onwards to Cairo, I scanned through a great book: `When the rivers run dry` from Fred Pearce. Just one impressing fact from his book: lake Nasser, in the south of the country, finished with Russian help in the 1960ties and filled with Nile water, on one hand helps to diminish flood threats further downstream. On the other hand.... the gigantic lake surface in the middle of the desert is responsible for an unbelieveable annual evaporation of about FIFTEEN square kilometers of river water. 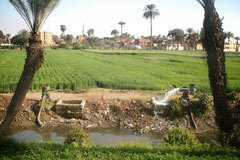 This is roughly a third of the annual flow of the Nile. Can you believe it? When approaching through the clear, dark skies from the north this evening, underneath me I saw the endless signs of civilisation, starting in Alexandria on the Mediterranen Sea, crossing the huge Nile delta onto Cairo. City lights and roads were everywhere, expect for a huge black stripe in the middle: the Nile, the lifeline of Egypt. All these dozens of millions of people underneath me depend on this river. What will the new government plan for the future of the Nile, which has to cope with roughly ONE MILLION newborn Egyptians each nine months? We`ll see it in the next days, we´ll keep you posted! Olkiluoto - Brrrr, cold out here! In the middele of March, this small island on the remote west coast of Finland is still covered under a thick layer of snow. Olkiluoto was supposed to become the symbol of the ´revival´ of nuclear power in Europe - but so far, it`s doesn´t really work that well yet. The new (third) EPR reactor which is currently being built on this island by AREVA-Siemens should have been on the electricity grid for years already, but the delay is enormous, and so are the unforeseen costs - billions and billions more than planned. Still, according to spokesperson Käthe Sarparanta, OL3 will be delivering electricity in the second part of 2013. Let`s see if this will really happen. The Colorado river in the western part of the USA is running dry. Climate change and population growth are the main reasons for the fact that the Colorado river, the lifeline of the American west, nowadays ends somewhere in the middle of the deserrt, and not in the Gulf of Mexico anymore. Together with photographer Ronald de Hommel, I travelled this great river last summer, as part of our `disputed waters` project. See more on: www.disputedwaters.com. And here`s a link to a feature about the river in German weekly Der Freitag (take a look at page 23). Last week, I published a feature about the tens of thousands of Poles, Romanians and Bulgarians in Rotterdam and the pressure they cause on poor neigbourhoods. Read it in www.groene.nl.